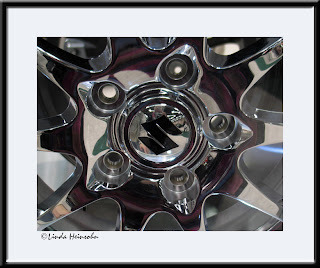 When I took this photo of a Suzuki wheel, I was wearing my pink multi colored scarf. You can see how it gave a kind of purple coloring around the wheel. You can also see my reflection just above the center of the "S" and if you look closely, you can see my daughter, Sarah to the left. I wonder if this would make an interesting orb photo?